Kim Dae Jung was a famous Leader from South Korea, who lived between December 3, 1925 and August 18, 2009. He became 83 years old. 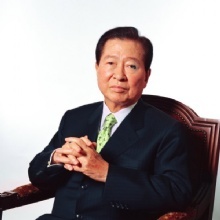 He was for many years, opposition politician before he was elected South Korean president in 1998 after several attempts. Since he started including the famous sunshine policy, which was to initiate a tilnærmnings and thawing policy toward North Korea. This culminated in June 2000 with a summit between the two Korean leaders in the North Korean capital of Pyongyang. For this work he received the 2000 Nobel Peace Prize. He completed his five-year term as president in 2003. He is born under the zodiac sagittarius, who is known for Philosophical, Motion, Experimentation, Optimism. Our collection contains 18 quotes who is written / told by Kim. "So such an American troops presence in Korea in the South and Japan, total some 100,000 should stay there forever, even after unification of Korean peninsula"
"So moderate is insisting that North Korea should open door to outside"
"But such IMF pressure is very much helpful for me to push such a, you know, reform. So in this sense I think IMF is very much helpful for alien society"
"American presence is, you know, the major cause of balance of power and the stability in this region"
"You know, North Korea situation is far worse than East Germany, and South Korea is weaker than West Germany"
"So in Asia I want to make - I want to succeed to make a model of what success, practicing democracy, and market economy. Then that will give a good influence over Asian countries"
"So if North Korea continues present isolation, then with such economic difficulties the North Korean government must meet a very serious situation in the future"
"And also, we are providing, you know, a nuclear power plant in the north, two light water systems, so some 4 or 5 billion dollars we are providing to meet with North Korean requests on the condition North Korea will not produce a nuclear weapon"
"Well, that is very imperative to let North Korea open door to outside"
"Unification is one thing, and stability in Northeast Asia is another thing"
"Unification is not our present goal. That is a future program"
"So South Korean ability is very much limited to handle North Korean, you know, difficulties. So we don't want to see an immediate collapse of the North Korea regime"
"To realize peace on the Korean peninsula, and to develop exchange, cooperation between both Koreas, they are the, you know, immediate target of our government"
"There is some sign that North Korea is changing recently. There is ongoing successful negotiation to have a military talk to Pyongyang, which has been stopped for seven years"
"So for mutual interest, I do want American presence in this region"
"I think a major cause of present Asian economic difficulties that mainly come from, you know, lack of market economy"
"So now we are pushing economic reform, bank reform and enterprise reform. So we can finish that reform this year, in September or October. Then our economy may be much more, you know, normalized"
"If America would withdraw from South Korea, there could be a power struggle between such as China and Japan"